Ontario Premier Kathleen Wynne recently announced a provincial budget spending $2.2 billion over three years to make full-day licensed child care free for preschool children from the age of two-and-a-half until they are eligible to start kindergarten, beginning in 2020. The plan includes $90 million in 2018-19 to support continued expansion of child care for children ages 0 to 4 years. The proposal, coming on the eve of elections June 7, is estimated to save families an estimated $17,000 (Canadian) per child. Extending free ECE to all families regardless of income would make Ontario the only truly “universal” program in Canada; Quebec relies on household income to determine the amount of daycare support a family receives and British Columbia plans to do the same, with a 10-year plan moving toward universal coverage. In the US, access to high-quality preschool depends largely on family income. Families who can afford it, generally enroll their children–if they can find a program. Others depend on publicly funded pre-K programs, either federal Head Start (which lacks the resources to serve all eligible children) or state-funded programs. The upcoming State of Preschool 2017 report will describe quality, enrollment and funding for state-funded preschool programs in 43 states, District of Columbia and Guam, based on the 2016-17 school year. Our report will highlight changes over the past year, as well as trends since 2002, when NIEER first began publishing the state pre-K yearbook, through 2017. 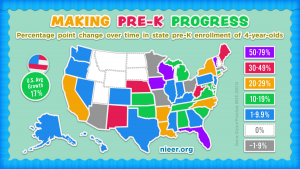 This infographic illustrates changes in state-funded pre-K enrollment from the first State of Preschool report in 2002 through 2015-16. 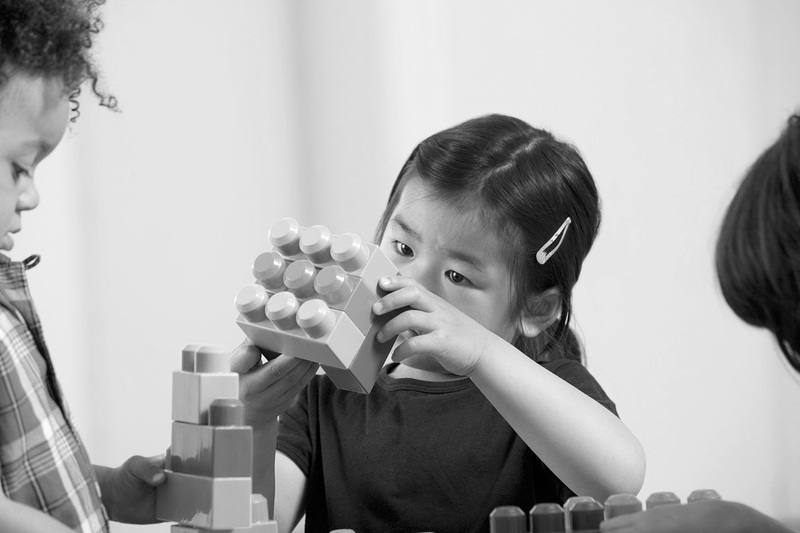 Look for the new annual report on our website Wednesday April 18, during the NAEYC Week of the Young Child. Will “Power to the Profession” Put Women and Children Last? So wrote Mary Dabney Davis in 1930 about a report from the National Association of Educators of Young Children’s (NAEYC) progenitor–the National Committee on Nursery Schools. It equally well describes the current NAEYC-led Power to the Profession Decision Cycles 3, 4, & 5 recommendations for teacher qualifications. The current draft sets out an AA degree as the entry-level qualification for teachers of children under age five. With nearly 100 years’ experience of low expectations we can be confident this entry-level qualification will not be a starting place, but a dead end. Look for NIEER faculty and staff during the AERA Annual Meeting in NYC from Friday, April 13 to Tuesday, April 17. NIEER invites you to attend two symposiums as well as our research paper sessions. “Early Childhood Research: Literacy, Assessment, and Class Size,” featuring NIEER Co-Director for Research Milagros Nores as a discussant. The Roundtable is collaboratively planned by CEELO, NAECS-SDE and national technical assistance partners. Learn more about the 2018 Roundtable here. In a new study published in the journal of Appetite, researchers examined child involvement in family food preparation. The study was based on surveys of the parents of preschool-aged children when children were three and four years old. Researchers found that involvement of young children in family food preparation at age three was predictive of increased consumption of fruits and vegetables and decreased consumption of fast food at age 4. Authors suggest that involvement of young children in family food preparation is predictive of healthier dietary behaviors in young children. They further suggest that outreach efforts focused on children’s involvement in family food preparation in early childhood may improve children’s dietary habits. Language Environment Analysis (LENA) is an automatic speech detection system that can be used to efficiently measure what adults and children actually hear and say. In a new systematic review of the literature published in the American Journal of Speech-Language Pathology, researchers examine dimensions of LENA research, its sensitivity to differences in populations and language environments, and its impact on closing the Word Gap. Authors report that LENA’s automated speech indicators of the audio environment meet high validity standards. They also suggest that that automated analysis has a place in language research and practice. Implications, limitations, and future research are discussed by the authors. In a new systematic review and synthesis published in Pediatrics, researchers reviewed the literature on the effects of Parent-Child Book Reading (PCBR) interventions on psychosocial functioning of children and parents. Authors suggest that while there is ample evidence that PCBR has impacts on young children’s language, literacy, brain, and cognitive development, its impact on psychosocial functioning of children and parents is not clear. Authors examined 19 interventions in the review. Researchers found that PCBR interventions are positively and significantly beneficial to the psychosocial functioning of both children and parents. In a new study published in Perceptual and Motor Skills, researchers explored the effects of background music on puzzle assembly task performance in young children. Participants were 87 children enrolled in early childhood classes in the northeastern United States. Researchers report that children who heard music without lyrics completed more puzzle pieces than children in either the music with lyrics or no music condition. They suggest that background music without distracting lyrics may be beneficial for young children’s performance on cognitive tasks. Limitations of this research and suggestions for future research are suggested by the authors. Conflict across the globe has displaced over 16.1 million refugees, authors suggest, with approximately half under the age of 18. In a newly published systematic review of research in Clinical Child Psychiatry and Psychology, researchers examined 18 manuscripts on the needs of refugee children and youth ages 5-18 years old. Study authors found that needs fell, overall, into the areas of social support, security, culture, and education. Authors suggest the current review can help inform future integration programs designed for refugee children and youth. Such programs can promote positive outcomes and can be beneficial for both refugees and members of host communities. In an article published in the journal Appetite, researchers set out to determine if very small amounts of common household ingredients of salt or sugar could lead to significant reductions in bitterness intensity and increased ratings of green vegetable purees. Researchers note that about 25% of adults and only 7% of children consume the recommended amounts of vegetables each day. They report that one of the reasons vegetables are not initially palatable is because they are perceived as bitter, which may lead both adults and children to refuse to taste or eat them. Researchers found the addition of small amounts of sugar and salt, each reduced the bitterness (and increased sweetness and saltiness) of broccoli, spinach, and kale without altering other sensory properties (e.g. texture or aroma). Researchers also found that adding sugar to vegetable purees increased the ratings for adult consumers. However, parents’ attitudes were mixed about the idea of adding sugar to foods intended for infants and toddlers. The authors recommend further research on the effects of bitterness masking especially for infants and young children or adults who are sensitive to bitter taste. The department is seeking a director for Special Education, Early Intervention and Early Childhood. This Office provides technical assistance to school districts and regional programs, leads program development and improvement of services, works cooperatively with educators and parents to improve the achievement of students with diverse learning needs, contracts for provision of state operated programs and services locally, monitors districts for compliance with state and federal law, and monitors educational services. This webinar marks the release of a new Migration Policy Institute report examining the challenges and successes major host countries in Europe and North America are experiencing in providing high-quality ECEC services. During the webinar, authors will discuss the report’s findings, highlighting promising policies and practices identified in field research, as well as key areas in which ECEC services for this population need to be strengthened.